HOUSTON — He may wear “Miami” across his chest, but it’s the city of Houston that has shaped his heart. This has been a challenging year for the Space City, and nothing was more difficult for Miami Heat star Justise Winslow than watching from afar as Hurricane Harvey howled through his hometown. This is why he donated $100,000 through his Robin’s House Foundation to various charities, including $50,000 to Small Steps Nurturing Center, an early childhood program that helps economically at-risk children and their families. The center used the funds to purchase two cars to give to two families after their own cars were lost to the floods. 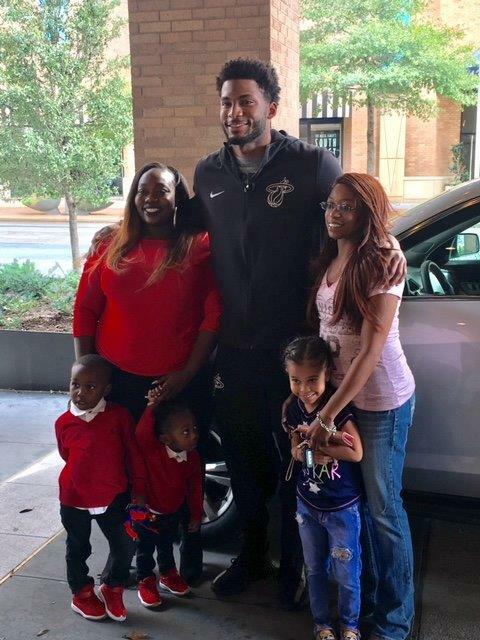 On Jan. 21, with the Miami Heat in town to face the Houston Rockets, Winslow met the families who received the vehicles at the Four Seasons Hotel in downtown Houston. Justise Winslow poses for photos with the families who received his car donation. “It feels so good to know that I have a safe car to drive to work, and be able to provide for my family,” said Lanesha Dabney, a 24-year-old single mother of two boys ages 2 and 4 who received a 2015 Chevrolet Equinox. “We appreciate this from the bottom of our hearts,” she told Winslow. The emotion poured out of the third-year wingman as he spoke about some of the role models in his life. Winslow grew up in an athletic family. His father, Rickie, was a member of the famed University of Houston 1984 Final Four basketball team. He started all four years at small forward for the Cougars and eventually played pro ball overseas until 2000. His sister, Bianca, also played for the University of Houston. His parents divorced when he was in grade school and his mother, Robin Davis, was awarded custody. Davis believed in the African proverb “It takes a village to raise a child.” This is why she encouraged her children to have other role models in their lives. Former NBA star John Lucas, the current player development coach for the Rockets, was one of those people. Every young basketball player growing up in Houston coveted an invitation to Lucas’ summer camp. NBA players regularly appear at these camps to get extra work in with the coach. Winslow recalled his time with Lucas as some of the most important moments in his life. On the court this year, Winslow and the Heat had a rough start. The 21-year-old missed 14 games with a left knee injury, and the team started 11-13. But since then, the squad has jumped back up to the top four in the Eastern Conference standings, at 27-21. Winslow returned to the lineup in Milwaukee on Jan. 17, giving Miami a clutch 3-pointer in the fourth quarter to seal the victory. Shooting 3s is not something he had to do in his first two seasons in the league. But because of injuries to Dion Waiters and Tyler Johnson, the third-year forward has been thrust into a new role. A lot is made in Miami about the so-called “Heat Culture,” a nickname for the franchise’s aggressive approach to conditioning and fitness. But Winslow said working harder than the next guy is a lesson he learned in his hometown.